Thanks to the efforts of militants like Elena Lagadinova, women in Communist countries enjoyed greater equality than almost anywhere else in the world. She’s probably the most fascinating feminist you’ve never heard of. And for the seven years I had the honor to know her, she shared her recollections of World War II and narrated an almost forgotten history of twentieth-century women’s activism. I learned of her sudden death in a staccato email from Bulgaria: the Amazon has left us. Her life spanned fascism, Communism, and klepto-capitalism, but she never surrendered hope. “The Amazon” was her code name. As a child of fourteen, Elena Lagadinova fought Bulgaria’s Nazi-Allied monarchy as its youngest girl partisan. Decades later, her passion helped define the international women’s movement during the Cold War. Once celebrated on both sides of the Iron Curtain, her story was lost in the vortex of political change following the collapse of Communism in 1989. Delivering a speech in 1970. 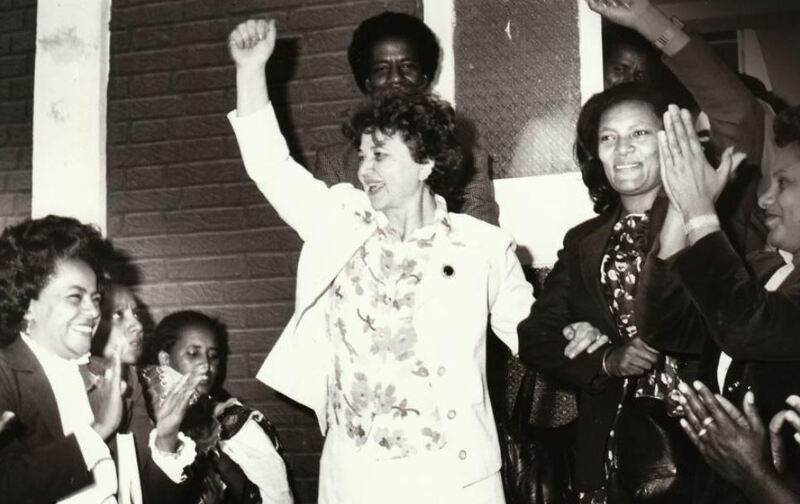 Lagadinova later earned a doctoral degree in agro-biology, and worked as a research scientist until 1967 when Bulgaria’s Communist leader needed a charismatic figure to take charge of the Women’s Committee. Already a war hero, a respected scholar, and the mother of three, the Amazon gave the next twenty-two years of her life to promote women’s rights. She was already eighty when I began interviewing her in 2010. Over the hundreds of hours we spent seated across her dining room table, Lagadinova regaled me with tales of her domestic and international efforts on behalf of women. Photos, letters, newspaper clippings, and official reports spilled out of her cupboards and closets, documenting epic struggles. Records in the state archives corroborated her memories. Thanks to Lagadinova’s persistence, the Bulgarian government in 1973 issued a special law giving working women generous maternity leave (up to three years for each child) with a guarantee that their jobs would be held in their absence and that years on maternity leave counted toward retirement. The state also committed to build thousands of new kindergartens. With Angela Davis in 1972. During the United Nations’ 1975 International Year of Women, Lagadinova led the Bulgarian delegation. She distributed translations of her nation’s new law, promoting the idea that women’s equality could not be achieved without state support. Despite the authoritarian nature of the regime, in this field Bulgaria became a model for other nations to emulate, and throughout the 1970s and 1980s Lagadinova forged an international coalition of women’s organizations to pressure governments to fund maternity leaves and childcare facilities. For Elena Lagadinova, that something was gender equality, and the idea that states must support women as workers and mothers. Lagadinova believed free markets would always place women at a disadvantage because of their reproductive role. The battle for true gender equality is far from over. But, just as the launch of Sputnik in 1957 spurred the West towards scientific and technological advancements, the activism of Eastern Bloc women like Elena Lagadinova arguably accelerated the advance of women’s rights in the West. Western countries could make excuses and issue caveats, but the fact remained: despite their many flaws, Communist countries had greater legal equality for women and stronger support for women as workers. To this day, the United States still lags behind the rest of the world in key respects, and remains one of only a tiny handful of countries lacking a paid parental leave law. On October 29, Elena Lagadinova died in her sleep, perhaps still dreaming of a time when women will be the full equals of men. An Amazon has fallen. But thanks to her efforts, there are armies more able to take up the fight. Kristen R. Ghodsee is a professor of Russian and East European Studies at the University of Pennsylvania. Her work has appeared in the New York Times, Foreign Affairs, and Dissent. She is the author of Red Hangover: Legacies of 20th Century Communism.